There are so many exciting things happening in Jacksonville right now. Below is an article from Modern Cities that gives a thorough update on all the projects. I saw this article and thought it was perfect to share. My son calls One Enterprise Center the “frog” building. I think it looks more like R2D2. Do you have a nickname for any Jacksonville buildings? 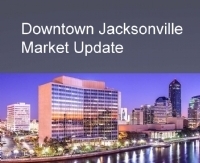 I recently gave a presentation at the Downtown Vision Stakeholders meeting on the Jacksonville market. Click on the photo to see the presentation and let me know if you have any questions!